ProSkills Trainers: Google Alert - "overcoming fear of public speaking"
We Provide Public Speaking & Presentation Skills Courses in KL, PJ, Malaysia & the Rest of The World! Contact us now to reserve a seat - enquiries@ProSkillsTrainers.com or 012-3508844 (Sandy Tan). 10 places only for each course. The programme runs from 9 a.m. to 5 p.m. on both days. The fee is inclusive of workbook, lunch & 2 tea breaks for 2 days. There are 10 places only for each session. Please hurry to register if you are interested. Mastering the use of PowerPoint & visual aids is indispensable to your success! You will learn to: 1) Craft great PowerPoint slides, 2) Present powerfully with PowerPoint, and 3) Use other types of visual aids (mainly whiteboard and flipchart). This 1-day programme is open to graduates of Dare To Speak™ only!! The programme runs from 9 a.m. to 5 p.m. The fee is inclusive of workbook, lunch & 2 tea breaks. There are 6 places only for each session. Please hurry to register if you are interested. Singkirkan rasa gementar! Berucap dengan bertenaga, bergaya dan berkeyakinan! Program Dare To Speak™ juga ditawarkan dalam Bahasa Malaysia dengan diberi nama Kursus Kemahiran BerpidatoBebas Bersuara™! Ciri-ciri lain kursus ini adalah seperti untuk Dare To Speak™. Jurulatihnya sama iaitu En. Azmi Shahrin. ialah dari 9 pagi hingga 5 petang pada kedua-dua hari. Yuran merangkumi buku kerja, makan tengahari, minum pagi & minum petang untuk 2 hari. Do you speak English but sound like a Malay, Chinese or Indian trying to speak English?That's because you are using sounds from your mother tongue instead of the right English sounds! Any cure? Yes, let us introduce you to the Speak Right!™ English Pronunciation Programme! In short, you will discover the common pronunciation errors made by Malaysians and learn the short cuts to sound dramatically better in 2 days! "Many people tell me I sound good when I speak English. But they seldom are able to identify the cause. The reason I sound good is because I pronounce every word correctly." 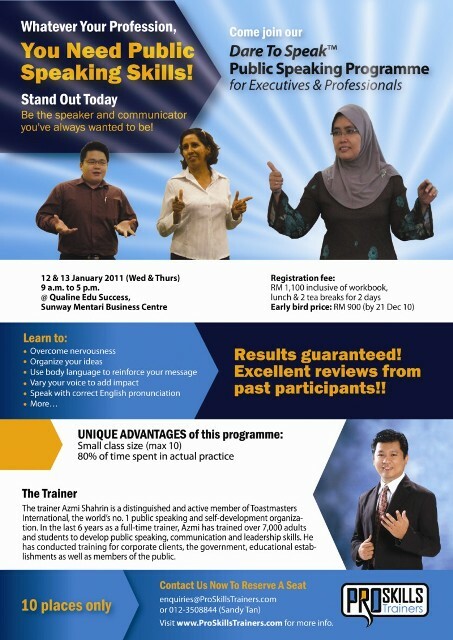 The trainer Azmi Shahrin is a distinguished and active member ofToastmasters International, the world's no. 1 public speaking and self-development organization. In the last 6 years as a full-time trainer, Azmi has trained over 5,500 adults and students to develop public speaking, communication and leadership skills. Besides conducting training for Toastmasters and programmes for the public, he has trained for Petronas, Tourism Malaysia, Ministry of Education, Ministry of Higher Education, Ministry of Defence, University of Malaya... read more. 1. Please contact us and provide your name, e-mail & contact no. and state the programme and the dates that you are interested in. You may contact us atenquiries@ProSkillsTrainers.com or 012-3508844 (Sandy Tan). 2. We will confirm the programme details including the applicable fee. 3. Please bank in or transfer the fee amount to our MBB (Maybank) account. The a/c name is PROSKILLS TRAINERS and the a/c no. is 5122 3133 5187. Please inform us after you make the payment. 4. In case you cannot make it to the programme, there is no refund but you may transfer the fee you have paid to a future session (qualifier). However, you still need to inform us at least 24 hours before the programme commences to qualify for the transfer. 5. The organizer reserves the right to cancel the programme due to unforeseen circumstances. In this event, a full refund of the fee will be made. Please do not hesitate to contact us if you require further information or clarification. The programmes above are open to the public. Companies etc. wishing to conductDare To Speak™, The Right Sound™, Kursus Kemahiran Berpidato or any other programme for their staff are most welcome contact us. Google Alert - "overcoming fear of public speaking"
"overcoming fear of public speaking"